A new generation of laser-cut FF & RC kits, with all needed hardware included in most full kits. Most FF kits contain Esaki tissue, good quality rubber, props, shafts, bearings, etc. Select a category (upper right of page) to browse our products. 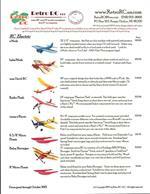 All new design for the 2019 Division C Wright Stuff rules, 35cm x 7cm wing. Intended for the student who has built and flown a rubber powered model airplane before. It flies with a rearward CG. It is more difficult to trim than a conventional set up. 35cm span, updated for the 2019 seasons rules. Great first build project for any age 11 and up. Designed to fly 80 sec. or better with stock prop and rubber. Adapted from Lloyd Shales' 1994 Minnow design with his blessing. Wax adhesive for holding miniatures in place repositionable and removable with soap and water. Great for holding small screws on driver! 20" wing span Embrio, designed by F. Baecke, laser cut full kit includes all wood, white & black Esaki tissue, all needed hardware, plastic prop, full size plans, FAI Super Sport rubber motor. 55" span Air Trails flying wing design contest winner. Reproduced as a laser cut kit that can be built for RC or FF, glow or electric. 54" span, SAM Legal 1/2A Texaco for Cox 049 or Electric powered. Designed in 1936 by Frank Dallaire from Detroit. 360 sq.in. wing area. Can be built RC or FF. Printed on heavy duty outdoor banner Tyvec(r), the slim Feather Wallet has 2 credit card pockets and two bill pockets. Each one is unique. Please add to your order for a free download link.